Tata Steel is headquartered in Mumbai, Maharashtra, India and has its marketing headquarters at the Tata Centre in Kolkata, West Bengal. It has a presence in around 50 countries with manufacturing operations in 26 countries including: India, Malaysia, Vietnam, Thailand, UAE, Ivory Coast, Mozambique, South Africa, Australia, United Kingdom, The Netherlands, France and Canada. Tata Steel primarily serves customers in the automotive, construction, consumer goods, engineering, packaging, lifting and excavating, energy and power, aerospace, shipbuilding, rail and defence and security sectors. Tata Steel has set a target of achieving an annual production capacity of 100 million tons by 2015; it is planning for capacity expansion to be balanced roughly 50:50 between greenfield developments and acquisitions. Overseas acquisitions have already added an additional 21.4 million tonnes of capacity, including Corus (18.2 million tonnes), NatSteel (2 million tonnes) and Millennium Steel (1.2 million tonnes). Tata plans to add another 29 million tonnes of capacity through acquisitions. 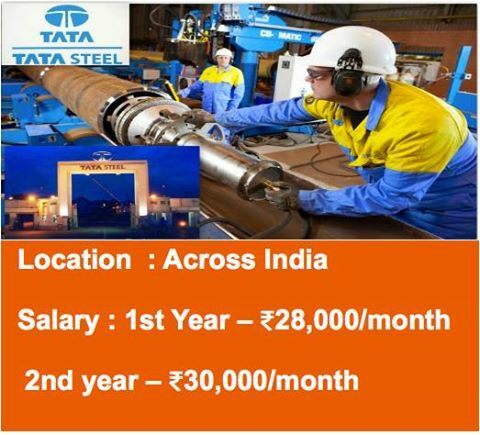 Major greenfield steel plant expansion projects planned by Tata Steel include: 1. A 6 million tonne per annum capacity plant in Kalinganagar, Odisha, India; 2. An expansion of the capacity of its plant in Jharkhand, India from 6.8 to 10 million tonnes per annum; 3. A 5 million tonne per annum capacity plant in Chhattisgarh, India (Tata Steel signed a memorandum of understanding with the Chhattisgarh government in 2005; the plant is facing strong protest from tribal people); 4. A 3 million tonne per annum capacity plant in Iran; 5. A 2.4 million tonne per annum capacity plant in Bangladesh; 6. A 10.5 million tonne per annum capacity plant in Vietnam (feasibility studies are underway); and 7. A 6 million tonne per annum capacity plant in Haveri, Karnataka.